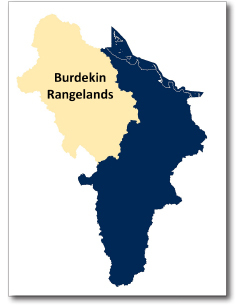 The Burdekin Rangelands sub-region is bound by mountains, and a large proportion of the area consists of strongly undulating terrain. To the west, the basalt plateaus of the Great Dividing Range rise to over 900m. The crest of the eastern ranges near Paluma supports rainforest and includes the southern extent of the Wet Tropics World Heritage Area. This sub-region features a small area of the Einasleigh Upland bioregion in the north, the Northern Brigalow bioregion in the centre, and the Desert Uplands bioregion in the south-west. Vegetation includes acacia open forest and eucalypt woodland. The Dalrymple, White Mountains and Great Basalt Wall national parks are found in the rangelands, along with nationally important wetlands including Lake Dalrymple. The lake is formed by the Burdekin Falls Dam on the Burdekin River, the largest dam in Queensland. The river and dam are popular destinations for fishing and bird watching. Charters Towers is the main urban centre in the Burdekin Rangelands. Established in 1867 and boosted by the discovery of gold, the current population of around 12,500 is supported by the mining and beef industries. Mining is a significant employer, however the majority of land is used for beef production on natural grasslands. Charters Towers sources its water from the Charters Towers Weir, and the town is an education centre, with boarding schools catering for remote rural families. It has many heritage buildings which, together with national parks, provide outback tourism opportunities. There have been calls from landholders and the Charters Towers Regional Council to expand irrigated agriculture in this sub-region, however this would require a secure and sustainable supply of water, careful consideration of land suitability and impacts on downstream systems.